And all the ridiculous, punny headlines about Fox new Monday night show Sleepy Hollow are almost as absurdly enjoyable as the show itself. The show premiered on Monday in a bombardment of historical hijinks, supernatural beheadings, witchcraft, and hot and heavy flirtation with threats of the apocalypse. You could hardly catch your breath to keep up with the break-neck pace of the plot, but apparently folk like their tv in a sprint, because more than 10 million viewers tuned in to catch the premiere, and the pilot rated better than any other Monday night show. But is this just an ADD-nation love-fest or is the show actually good? Well, oddly enough, there’s actually too much information to tell at this point. In just an hour the show introduced us to our main protagonists — Lt. Abbie Mills (the ridiculously gorgeous Nicole Beharie) and Ichabod Crane himself (Tom Mison) — beheaded 3 key characters, and basically unraveled every single mystery it had introduced in the first half of the show…. If they keep up this kind of narrative pace, it’s hard to imagine what they’ll have left to tell after 3 or 4 episodes. Then again, there’s a chance the plan is to get all the plot/surprise/mystery stuff out of the way and really delve into the character’s relationships. This is not a feeble hope either. There’s plenty of room for development there. 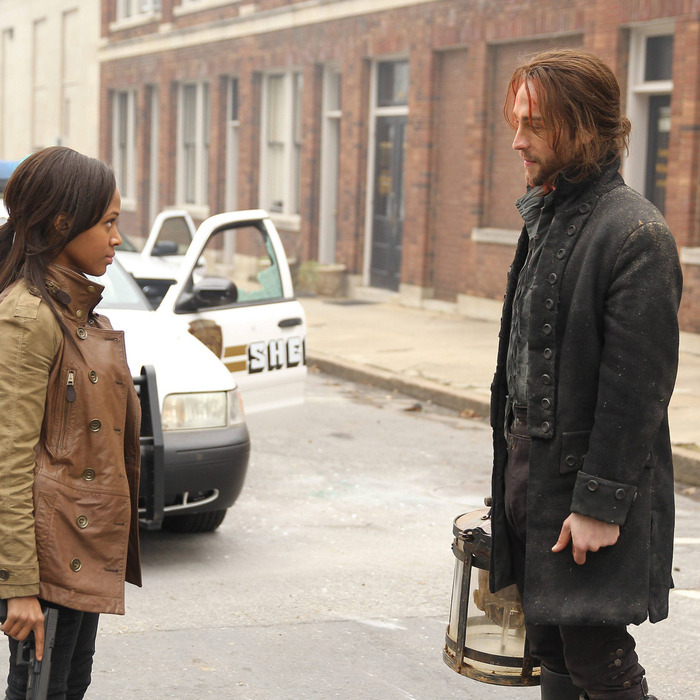 Abbie and Ichabod made fast friends in this first episode, after a couple quick bumps in the road, such as when Ichabod’s 18th century misogyny is offended by Lt. Mills’ wearing “trousers” or when Abbie has to side-eye Crane when he questions how a Black woman is allowed to be a police officer. In this more or less unprecedented case of a Black female lead and a White guy lead sharing screen time (equally!) and playing characters out of time and out of place respectively, there could be a lot to work with there. Likely in less profound ways than Octavia Butler’s Kindred, for example, but maybe in the brief reprieves from heads rolling, these two can establish a meaningful rapport… or at least a sarcastically hilarious one as a point of stability in the whacky whirl of supernatural tropes. I mean, seriously, in spoilery summary: A time-travelling headless horseman abandons his magical axe for an arsenal of automatic weapons in order to fight a Red Coat superspy scholar revived from death by his good witch wife (whose spirit is stuck in a creepy la la dimension battling demons and evil witch covens) who’s supposed to stop headless baddie from getting his head back, waking up the four-horsemen of the apocalypse and getting his world-destruction on. Regardless, this geek is tuning into episode two and holding out hope that a sci-fi series led by a Black woman hero will be ridiculously awesome (or at least awesomely ridiculous)… ’cause it’s about time. Fine, also because I heart Orlando Jones. I mean, how can you not? I’m watching, too! I’m curious enough…I’m game. The sense that maybe they’ve overdone it with the supernatural content makes it even more promising. Better over than under in this kind of situation, I say. Ha! Great perspective. Here’s hoping the very literal *over kill* continues. And I’m dying for more puns (did you catch the beheaded “Caution horse riders” sign? Let the heads roll!